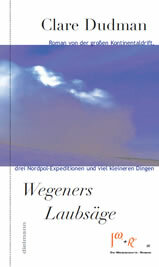 WEGENER’S JIGSAW gives a fictionalised account of the heroic life of Alfred Wegener. His accomplishments were quite astonishing: he established how craters were formed on the moon, how raindrops form in clouds, and how to predict the site of meteorite impact craters. He also mapped unexplored areas of the Greenland and established many world records in Arctic travel and aeronautics. But the main reason that Alfred Wegener is remembered today is for his development and defence of his contentious theory of Continental Drift. He received widespread ridicule for his ideas and tragically did not live to witness its general acceptance by the scientific community in the 1960s. WEGENER'S JIGSAW aims, for the first time in English, to present a full account of this important scientist's ideas in a lyrical and accessible way. 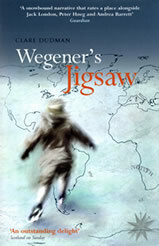 To read an extract from Wegener's Jigsaw please click here. "A first-person narrative in Wegener's voice, this story artfully captures his Arctic expeditions and evokes a life of scientific obsession and discovery." "Impressive first novel about German scientist and Arctic explorer Alfred Wegener (1880-1930)... Dudman's description — whether of an ice-quake, a dockside farewell or a lecture going wrong — brings Wegener alive on every page." Michael Upchurch Seattle Times Paperback Review. 27th March 2005. "Dudman has written a beautiful first person narrative of this passionate man’s life." "It is an ambitious undertaking - beautifully, sinuously written ....an outstanding delight." "...a snowbound narrative that rates a place alongside Jack London, Peter Høeg and Andrea Barrett.."
"....A splendid vehicle for a depiction of a time, not so long ago, when science could still cost you your life." "combines the Teutonic intensity of The Magic Mountain with the cold, austere locations of The Call of the Wild…The animus of motivation, the thrill of adventure and the terrifying beauty of a forbidding region are all described with profound insight." David Isaacson. The Daily Telegraph, 20th September 2003. 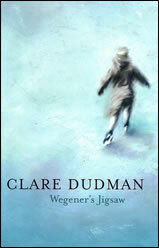 "Clare Dudman’s enchanting fictionalised account of his life is narrated by Wegener himself." "....Dudman has taken a relatively obscure historical tale and wound it into a fascinating thriller." "...a study of obsession as vividly imagined and subtly askew as Wegener’s passion itself." "... Clare Dudman has the rare gift of conveying the poetic leap of imagination that turns empirical imagination into theory... "
"..a great dramatisation of an Old World adventurer whose insatiable desire for knowledge and lust to experience nature first hand basically changed the way we see the world." Steve Woodman, Central Coast Herald & Newcastle Herald, Australia, 21st June 2003. "...Anyone, reader or writer, who values superb writing should also read this book." "...exquisite writing...A bitter sweet tale of endurance of body and soul, heart rending in its beauty." "... blends impressive research with a dignified prose style that effectively evokes the turn of the 20th century…will fascinate anyone with an interest in how science is done… substantial and rewarding…"
"…a first-rate historical novel; one that informs as well as being a gripping read." 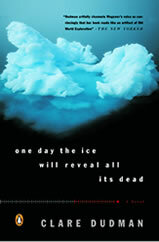 "In British author Dudman's stunning first adult novel, she reveals the poetry of science, interweaving a deep character study of German meteorologist Alfred Wegener (1880-1930) with scenes of pulse-pounding Arctic adventure…Dudman's prose is luminous ..(and she) displays an astute gift for characterization…emotional yet understated …(a) wise, beautiful novel." "Dudman communicates the excitement of new thinking, the thrill of intellectual leaps and the frustration of the experimenting and measurement-taking. Better yet, she avoids boring the reader. She knows how much detail to give, and when to stop." "Dudman tells her story with convincing verisimilitude, and her preface includes an Arctic set piece Barry Lopez could envy..."
"Dudman not only fills in an important historical gap but also gives us the story of a very interesting man." "…stunningly poetic… a thorough, as well as a thoroughly intriguing, novel that beautifully portrays one truly fascinating man." "Her writing is certainly very beautiful, exquisitely sensitive to the complex character of the natural world, the sensuality of air and rock and mica…As gorgeous and rigorous as a Mark Rothko painting…"
"Dudman artfully channels Wegener’s voice—prim and fastidious, but filled with longing—so convincingly that her book reads like an artifact of Old World exploration." "...an uplifting book....Dudman does a stunning job of placing you in the heart of the four expeditions... intensely suspenseful, and Wegener's sense of wonderment at his surroundings is just as raw and exhilarating...a first novel as accomplished as many veteran writers' efforts." "…one of the pleasures of this novel lies in her portrayal of the process of scientific discovery. Wegener's grand ideas didn't jump out at him from lab data; they came by connecting a lifetime of observations -- in the Alps, the Greenland ice fields and the library stacks." "...a gripping, passionate adventure novel--about science...as swashbuckling as an "Indiana Jones" movie, as heartbreaking as any great romance, and a stunning work of artistic prose… a frozen jewel for anyone longing for a truly great human adventure." "...a portrayal of both science and scientist in action that is breathtaking in scope.... engrossing,... alternately heartbreaking and heartwarming...a nuanced portrait of a man whose dogged dedication to science and belief in himself not only cost him his life but changed the world."